One goal of Salish Kootenai College’s social work program is to undertake research that Native American tribes can use to tailor their social programs to their communities. Located on the Flathead Indian Reservation in Pablo, MT, the social work department has two research proposals under consideration. One is a needs assessment of pregnant and parenting teens that will be implemented by Salish Kootenai students, and the other is a potential survey of the different resources Native people are using to become knowledgeable about climate change. But the most important goal of the program is to help develop Native American expertise in social work. It’s the first Native program to be accredited by the Council on Social Work Education. Rather than just focusing on federal and state laws, Salish Kootenai focuses on tribal laws as well. The program draws students from many tribes and emphasizes cultural competency in its teaching. According to Co Carew, MSW, LCSW, the BSW director, she’s had no problem placing students in internships, and almost all the social work classes are taught by Native faculty. However, while getting more Native American social workers into the field will undoubtedly benefit Native American communities, it’s important to note that being non-Native shouldn’t deter social workers who are interested in working in such communities. Although non-Native people may have more to learn about tribal practices and culture, they can still develop effective clinical relationships with Native American clients. Many Americans would probably be surprised to learn that there are several sovereign nations located within U.S. borders. According to the U.S. Bureau of Indian Affairs, there are 565 federally recognized tribes of Native American people in the lower 48 states and Alaska, and many of these groups have land bases that are governed according to tribal law. But partly due to federal statistics that don’t differentiate between tribal groups and partly due to inaccurate representation in popular culture and mainstream media, many people in the United States think of these disparate people as a single group—when they think of them at all. While stories about high rates of poverty, substance abuse, and suicide in Native American communities—such as the ongoing youth suicide crisis at the Fort Peck Indian Reservation in Poplar, MT—most often grab headlines, they tell only part of the story. History and culture are living entities in Native communities, and they exert a great deal of influence. For social workers, understanding the cultural differences of a particular community is an essential part of understanding how to work with the people who live there. Although there are some similarities among Native communities, Haring says social workers need to be aware of the community’s history, including when the tribe first made contact with Europeans and what events may have occurred as a result of that contact. 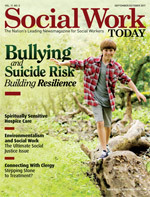 Haring says cultivating an understanding of Native clients’ needs and differences will help social workers build a foundation of trust and mutual respect. Social workers should also recognize differences in the languages and traditional practices of the tribes they work with. In addition, they need to be aware of the role that historical trauma plays in the worldview of many Native Americans. One of the most difficult chapters in the history of relations between Native and non-Native Americans is the boarding school era. The boarding schools were designed to assimilate Native Americans into the culture of white America. Native dress, languages, and customs were completely forbidden. The first of these schools opened in 1879, and several more followed. Scores of children were taken from their homes at a very young age in an effort to “kill the Indian” in them. Although the U.S. Bureau of Indian Affairs issued an official apology in September 2000, resentment and mistrust of the U.S. government still run deep among Native people. Part of the reason for this resentment is that the boarding schools, although their mission changed somewhat over the years, existed in some form for nearly a century. While many people who have heard of the boarding schools think of them as a late 19th or early 20th century phenomenon, there are still many people who lived through boarding school experiences. Coming to terms with the complex feelings associated with boarding schools is a significant challenge for many students in her program, according to Carew. Contributing to the uneasy relationship between Native Americans and the federal government is the issue of sovereignty. The Wheeler-Howard Act of 1934, also known as the Indian Reorganization Act, imposed on tribes governmental structures that were foreign to most Native communities. DuBray says rather than emphasizing kinship and cooperation, the new structures emphasized the pursuit of power. This has led to a situation on some reservations where federal money doesn’t reach the people who need it most. However, some tribes choose not to accept any federal money, instead relying solely on Native sources of funding. DuBray adds that formal systems and services offered within some tribes are 30 to 40 years behind the rest of the country, partly due to a lack of resources and partly due to a lack of expertise. At Pine Ridge, the fact that the unemployment rate hovers around 80% exacerbates the situation and because the area the reservation serves extends far beyond its official boundaries, lack of transportation is a significant barrier to care. Conducting an accurate census—the basis for the distribution of most federal funds—is also a factor. Because of high unemployment, many residents spend only part of the year on the reservation. This makes it difficult to gauge how many people actually need social services. It doesn’t help that federal housing allowances cap the number of people who can be claimed at an individual residence, which causes chronic underreporting. DuBray estimates that the population of Pine Ridge is easily twice the official estimate, which would make it South Dakota’s second largest population center behind Sioux Falls. She believes that rather than simply contributing money to the status quo, the federal government could significantly help Native communities by promoting tribal sovereignty.